At Power to Change we kick off today an England-wide campaign today calling on community businesses to celebrate their success and the positive impact they have had on their local areas. The #handsupforCB campaign coincides with the launch of the new £10 million Community Business Fund which will support existing community businesses to grow, increase their social impact and become more sustainable. Community businesses will be sharing on social media images of themselves with their hands in the air celebrating their success using #handsupforCB. One example of a community business in action is Kiveton Park and Wales CDT (Community Development Trust) in Rotherham, South Yorkshire. 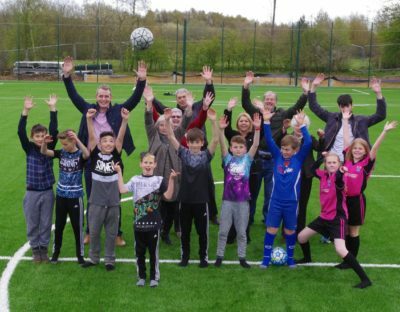 It is transforming derelict land in this former mining town into a state-of-the-art football pitch to help improve the health and wellbeing of the community using a grant of over £300,000 from Power to Change. The trust is led by local people and has 200 members and community groups that feed into development plans. Steph Hryschko, chair of Kiveton Park and Wales CDT said: “My dad worked underground at Kiveton Colliery for 27 years. It destroyed his health and he died of emphysema like so many of his generation from our community. It is a sweet irony that we will have such an amazing facility on top of that same land to improve the health of this generation and the next. A great legacy our mining forebears would be proud of. Vidhya Alakeson, Chief Executive of Power to Change, said: ‘We are proud to celebrate the achievements of community businesses today and raise awareness of the valuable contribution they make. Community businesses are boosting their local economies, creating jobs, and like Kiveton Park and Wales CDT, improving local people’s lives and making their local area a better place to live. Keep up to date with the latest community business news and events. Find out more about new sector research, funding programmes, and training events.